Ten years old, her mother gone, and now she's moved to a new town called Naomi, Florida where she has no friends, knows no one, and carries a load of hurt in her heart. This is where we find Opal Buloni. She's about to go into a grocery store for the shopping trip of a lifetime as down the aisles comes a rollicking, big, happy dog charging into things and knocking the oranges and melons in every direction. "Whose dog is this," the store manager demands to know. Opal, having never seen the dog before, claims him instantly. "What's his name?" The answer comes to her in a heartbeat..."Winn-Dixie." That's the name of the grocery store. So begins a journey of friendship and growing for Opal. She finally has a friend she can talk to about her feelings about her missing mother. She finally has a friend whose warmth and grinnning face makes instant friends and opens the town of Naomi for Opal. Together Opal and Winn-Dixie are going to befriend a cast of characters from Gloria who is nearly blind to Otis who lets the animals in his pet shop loose after closing time and on to Ms. Franny Block the librarian. Opal's father, though a minister, has let himself become preoccupied with his new church. 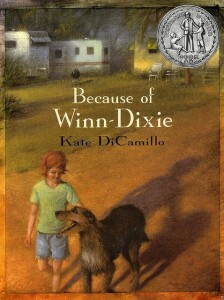 With Winn-Dixie in their lives, he stops and takes time to tell his daughter about her mother. A tender story that will touch the soft places in all of us. Friendship, connection, kindness and taking time to see the value and wonder in everyone we meet is the gift we receive from one big, old ugly dog named Winn-Dixie. Not to be missed.